An American in Ireland: America - are you out of your gourd? America - are you out of your gourd? You can't eat these things, right? I was in a store in upstate New York the other day – I can't remember which – when I overheard two ladies discussing where was the best place to buy decorative gourds. No, I'm not kidding. Decorative gourds? When did that become a thing? I've lived outside America for a long time and I have spent very few October days in the US of A over the last ... 24 years. When I left I'm pretty sure decorative gourds were not a thing. 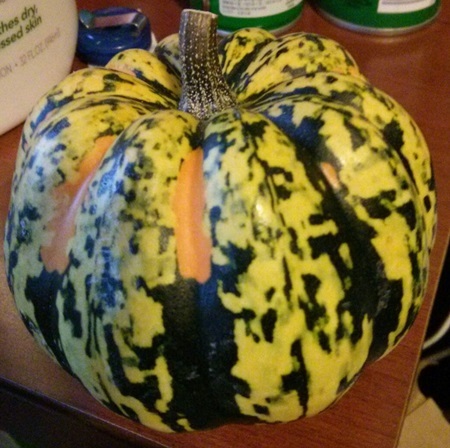 After I hearing those two women – and after I'd stopped chuckling – I started noticing that there are gourds everywhere. Even in the church I went to on Sunday there are gourds. Are some of these actual former living things? I have no idea, and I don't care. I don't think you can eat them, whether they were once alive or not. So what's going on here? Where did all these gourds come from? When did they become a vital part of my fall? Now I know that most of my memories of October and Halloween are from my childhood, but I was 27 when I left America. If gourds had been a thing before I left in 1991 I'd have known about it. And if I didn't, my wife surely would and she'd have asked me about this strange American custom of decorating your house or church or office or ... anything with gourds. I'm sure there are people out there who take their gourds seriously, but I can't take them seriously.